Qatar is the largest exporter of liquefied natural gas (LNG) in the world, and the country’s exports of LNG, crude oil, and petroleum products provide a significant portion of government revenues. Like many of its neighbors, Qatar relies on its energy sector to support its economy. According to the Qatar National Bank (QNB), Qatar’s earnings from its hydrocarbon sector accounted for 49% of the country’s total government revenues in 2014, a figure that has declined over the past four years.1 The U.S. Energy Information Administration (EIA) estimates that Qatar earned $38 billion from net oil exports in 2014. Qatar was the world’s fourth-largest dry natural gas producer in 2013 (behind the United States, Russia, and Iran), and it has been the world’s leading liquefied natural gas (LNG) exporter since 2006, with 31% of market share in 2014.2 Qatar is also at the forefront of gas-to-liquids (GTL) production, and the country is home to the world’s largest GTL facility. The growth in Qatar’s natural gas production, particularly since 2000, has also increased Qatar’s total liquids production, as lease condensates, natural gas plant liquids, and other petroleum liquids are a significant (and valuable) byproduct of natural gas production. Qatar produced 2.1 million barrels per day (b/d) of petroleum and other liquids in 2014, of which 1.5 million b/d was crude oil and the remainder was noncrude liquids. Although Qatar is a member of the Organization of the Petroleum Exporting Countries (OPEC), the country is the second-smallest crude oil producer among the 12-member group. Natural gas meets most of Qatar’s domestic energy demand, so the country is able to export most of its liquid fuels production. 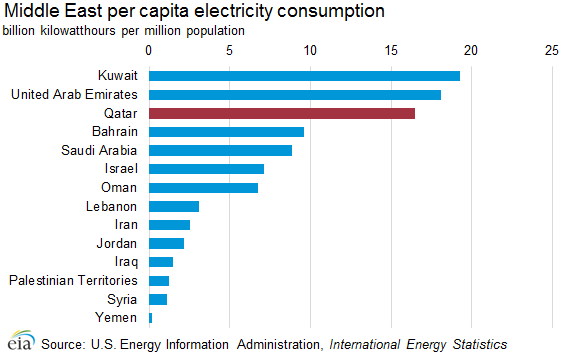 Given its small population, Qatar’s energy needs are met almost entirely by domestic sources. The state-owned Qatar Petroleum (QP) controls all aspects of Qatar’s upstream and downstream oil and natural gas sectors, including exploration, production, transport, storage, marketing, and sale of crude oil, natural gas, natural gas liquids, liquefied natural gas, gas-to-liquids (GTL), refined products, and petrochemicals and fertilizers. Qatar often focuses its natural gas development on integrated, large-scale projects linked to LNG exports or downstream industries that use natural gas as a feedstock. These projects tend to include investment from international oil companies (IOCs) with the technology and expertise in integrated megaprojects, including ExxonMobil, Shell, and Total. The Qatargas Operating Company Limited (Qatargas), which operates four major LNG ventures (Qatargas I-IV), and Ras Laffan Company Limited (RasGas), which operates three major LNG ventures (RasGas I-III), lead Qatar’s LNG sector. Each venture has an individual ownership structure, although QP owns at least 65% of each. The Qatargas consortium includes QP, Total, ExxonMobil, Mitsui, Marubeni, ConocoPhillips, and Shell. RasGas is 70% owned by QP and 30% owned by ExxonMobil. The two LNG companies handle all upstream to downstream natural gas transportation themselves, while the Qatar Gas Transport Company (known as Nakilat) is responsible for shipping Qatar’s LNG. In the oil sector, while QP owns and operates the onshore Dukhan field and the offshore Maydan Mahzam and Bul Hanine fields, IOCs operate the remaining offshore fields via production sharing agreements (PSAs). To increase production and reserves and to mitigate natural gas-related capital expenditures, QP offered more favorable terms for PSAs in recent years. Qatar’s electricity sector has several important entities, including the Qatar Electricity & Water Company (QEWC), which owns and manages the country’s electric and desalinization plants. The Qatar General Electricity & Water Corporation owns and operates the country’s electricity and water distribution networks. In the wake of declining oil and natural gas prices, QP announced a restructuring program in June 2015 aimed at cutting costs and increasing efficiency.4 5 It is too soon to understand the long-term effects of the restructuring program, although the effects are expected to have a significant impact on how QP does business, both domestically and internationally in all energy sectors. Qatar’s crude oil production is the second lowest in the Organization of the Petroleum Exporting Countries (OPEC), but increasing production of noncrude liquids–most of which are a byproduct of natural gas production–is contributing to gradual growth in total liquids production. 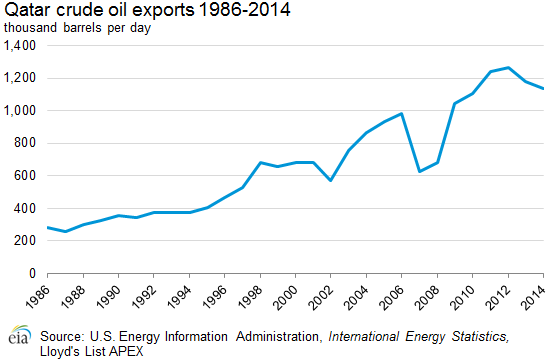 Qatar has been a member of OPEC since 1961. 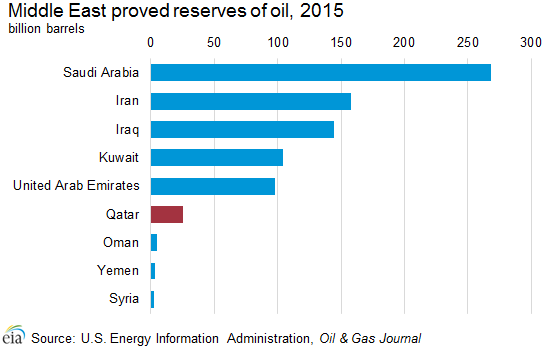 With proved reserves of crude oil estimated at 25.2 billion barrels by the Oil & Gas Journal (as of January 2015), Qatar holds the 9th largest reserves in OPEC and 13th largest in the world. Qatar’s crude oil and lease condensate production ranks 17th in the world, with most of the country’s production sent abroad as exports. Three oil fields account for more than 85% of Qatar’s crude oil production capacity. Oil exploration activity in Qatar is ongoing, although not to the degree seen in other oil-producing countries. The latest major discovery in Qatar came in 1994 (the Al Rayyan field), and any supply growth in the near term is likely to come from increased output at Qatar’s existing fields, particularly through the use of enhanced oil recovery (EOR) techniques. Operators have used EOR techniques in several fields, including Al-Shaheen, Dukhan, Bu Hanine, and Maydan Marjam. Qatar’s oil production comes from just a few fields, led by Al Shaheen, Dukhan, and Idd al-Shargi, which combined account for more than 85% of the country’s crude oil production capacity. Qatar’s petroleum and other liquids production, which includes crude oil, condensates, natural gas plant liquids, and other liquids, was 2.1 million b/d in 2014, a slight decline from 2013, but up 64% since 2005. Qatar produced more than 1.5 million barrels per day (b/d) of crude oil and condensates in 2014, according to estimates from the U.S. Energy Information Administration (EIA). 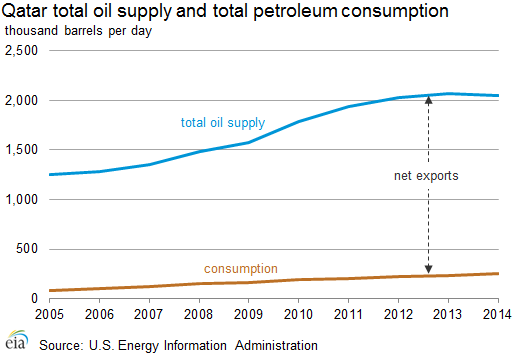 Note: These totals may not reflect non-crude liquids production capacity for these fields. 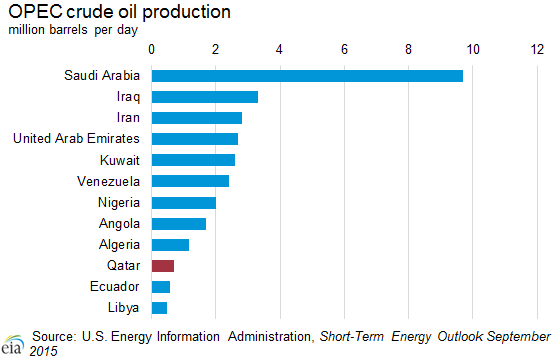 Qatar was the third-smallest crude oil exporter among OPEC members in 2014, ahead of only Ecuador and Libya. Qatar does not import any crude oil and only occasionally imports petroleum products, because the country’s production and refining sectors more than meet domestic demand. In fact, because Qatar’s natural gas meets so much of Qatar’s energy demand, the country exports most of its crude oil and petroleum product production. Qatar exports petroleum and petroleum products from three major export terminals: Umm Said (Mesaieed), Halul Island, and Ras Laffan. QP’s offshore pipeline network brings crude oil from offshore oil fields to Halul Island where oil can be processed for export. Onshore, most oil is sent to the Mesaieed (Umm Said) terminal for refining or export. According to the OPEC Annual Statistical Bulletin 2015, Qatar exported 595,000 b/d of crude oil and 522,000 b/d of refined petroleum products in 2014.11 In 2014, Qatar sent all of its crude oil refined product exports to Asian countries, according to OPEC estimates. Most of Qatar’s refined products (60% or more) go to Japan. Qatar has three main crude streams: the Qatar Land, Qatar Marine, and Al Shaheen. The Qatar Land and Qatar Marine blends are both lighter crudes, while the Al Shaheen is slightly heavier. The Qatar Marine and Al Shaheen streams have high sulfur content, while the Qatar Land’s sulfur content is slightly lower. Qatar’s refining capacity exceeds domestic demand for petroleum products, thus enabling the country to export most of its refinery output. Natural gas is at the center of Qatar’s energy sector. Qatar remains the world’s largest exporter of liquefied natural gas (LNG) although production has plateaued in recent years. As of January 2015, Qatar had the third-largest proved reserves of natural gas in the world at 872 trillion cubic feet (Tcf), according to the Oil & Gas Journal.14 Nearly all of Qatar’s reserves are in the country’s North Field, which is part of the world’s largest natural gas deposit. Together, Iran’s South Pars and Qatar’s North Field comprise the entire deposit. There is currently a moratorium on new projects in Qatar’s North Field while operators continue to examine ways of sustaining high levels of output over the longer term. The moratorium, initially scheduled to end in 2008, will run through at least 2015 after several extensions. 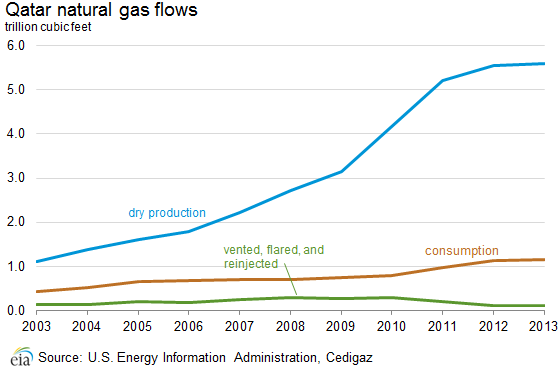 As a result, natural gas production has plateaued and could begin to decline soon. The only potential for a near-term increase in natural gas production lies in the 1.4 billion cubic feet (Bcf) per day Barzan project, which was the last project approved before the North Field moratorium.15 Scheduled to come online in 2016 and reach maximum production capacity in 2017, Barzan is only expected to offset some of the foreseen production decline. 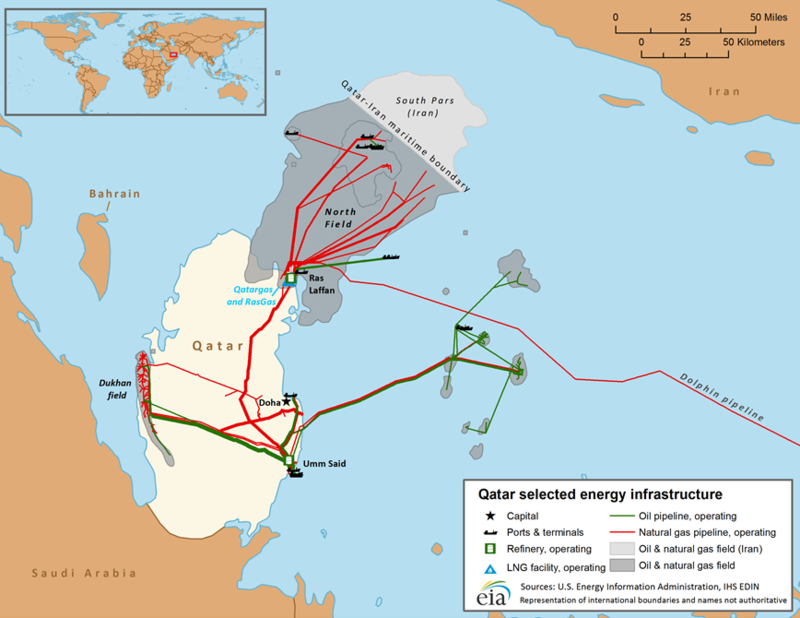 Qatar spent many years developing its natural gas resources–particularly in the North Field–and in 2013, Qatar was the second-largest dry natural gas producer in the Middle East and the fourth-largest producer in the world. 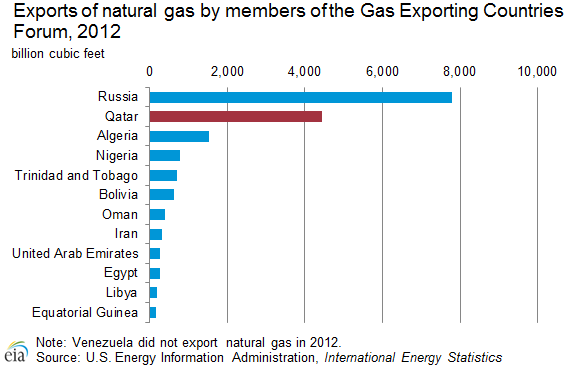 With its relatively low domestic energy demand, Qatar is able to export nearly all of its natural gas production. As such, Qatar has been the world’s leading exporter of LNG since 2006, and is a member of the Gas Exporting Countries Forum (GECF). Qatar’s natural gas production has increased its output of condensates and natural gas plant liquids, which are valuable byproducts of natural gas production. Qatar’s condensate production is approximately 700,000 b/d with exports of about 500,000 b/d, making it the largest condensate exporter in the world.16 Qatar is also at the forefront of gas-to-liquids (GTL) technology, which processes natural gas into heavier hydrocarbons, such as distillates and naphtha. Nearly all of Qatar’s natural gas production comes from the North Field, which is part of the largest nonassociated natural gas field in the world. Qatar’s dry natural gas production reached 5.6 Tcf in 2013, up from 1.1 Tcf in 2003. Most of Qatar’s production comes from the North Field, although some smaller fields contribute production volumes as well. The $10.4 billion Barzan Gas Project should boost Qatar’s natural gas production from the North Field in the near term. The project consists of both onshore and offshore developments, including offshore platforms, pipelines, and a natural gas processing unit. Announcements by government officials and ExxonMobil indicate that the project–which began in 2011–will begin operations in 2016 and be capable of processing 1.4 Bcf/d of natural gas. Qatar is a global leader in gas-to-liquids (GTL) technologies, and the country has two operational facilities. GTL technology uses a refining process to turn dry natural gas into liquid fuels, such as low-sulfur diesel and naphtha, among other products. Qatar is one of only three countries–with South Africa and Malaysia being the others–to have operational GTL facilities, although pilot projects in a number of other countries are underway. Qatar’s natural gas consumption continues to rise as the country’s overall energy demand rises along with its economy. Qatar meets all of its internal natural gas demand from domestic sources. 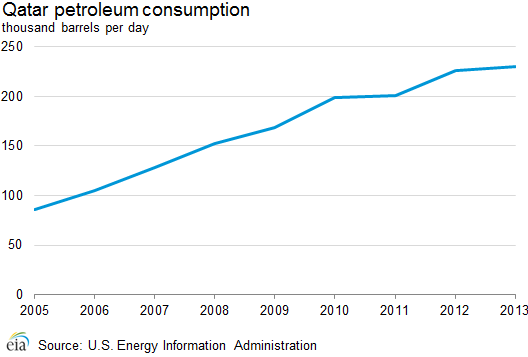 Natural gas consumption has grown quickly over the past several years, nearly tripling between 2003 and 2013. 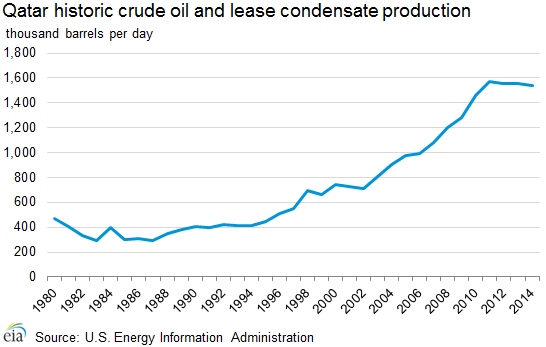 This growth rate tracks closely with overall natural gas production, which more than quadrupled over the same period. In 2013, consumption reached 1.2 Bcf/d, growing 46% from the 2010 level. The electricity and water (desalinization) sectors account for most of the natural gas consumption in Qatar. Qatar is the world’s second-largest exporter of natural gas, exporting nearly 4.3 Tcf in 2014, and the country was again the world’s largest LNG exporter, as it has been since 2006, accounting for 32% of global natural gas exports.24 Most of Qatar’s exports go to markets in Asia in the form of LNG, while the country sends a small amount of natural gas via the Dolphin Pipeline to the United Arab Emirates (UAE) and Oman. Historically, most of Qatar’s LNG exports were part of long-term, oil-indexed contracts, but over the past few years the country began to shift to more short-term contracts and spot-market sales. In 2012, Qatar exported more than one quarter of its LNG as short-term or spot-market sales (19.9 MMt according to QNB), accounting for more than a third of short-term and spot-market sales in the world.26 Several recent agreements between Qatargas and international LNG importers are of the short-term variety, including a deal based on continental European prices rather than oil-indexation for the first time in the company’s history. Qatar has more than 90% of its LNG production volumes committed as part of supply purchase arrangements (SPAs) between 2014 and 2021.27 LNG production growth elsewhere in the world over the next few years may challenge some of Qatar’s remaining spot volumes, although with most of its LNG already sold, the impact on Qatar’s natural gas exports should be limited in the near term. 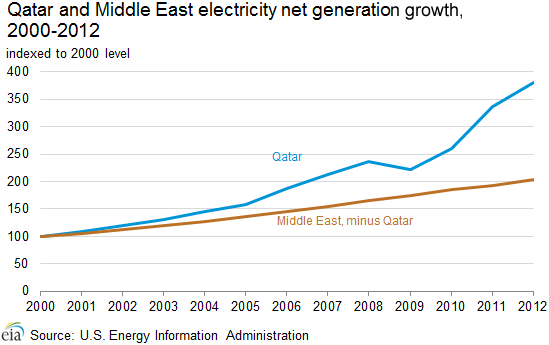 Rising electricity demand stemming from LNG expansions and economic growth has led to plans for significant growth in electricity generation capacity in Qatar. With one of the fastest growing economies in the world over the past few years, energy demand in Qatar has risen significantly, particularly electricity demand. All of Qatar’s current generating capacity is natural gas-fired, although there have been some discussions on potential solar power projects over the past several years. Qatar is not currently pursuing coal or nuclear generating capacity. Qatar is participating in the Gulf Cooperation Council’s efforts to link the power grids of member countries. Between 2000 and 2012, Qatar’s electricity consumption grew from approximately 8.0 billion kilowatthours to 32.7 billion kilowatthours. Data presented in the text are the most recent available as of October 20, 2015.